So what if I told you there was a way to have it all? To have the comfort that comes with humidity in a small, convenient and universal package which could be used with any CPAP machine and mask on the market? It sounds too good to be true, but it's not. The answer is a Heat Moisture Exchange module, or HME for short. HMEs are used in other fields of medicine, like anesthesiology, for preventing dryness of the tissues in the respiratory tract - both upper and lower. HMEs, like CPAP therapy, have been in use for more than 30 years. In essence, an HME is simply a sponge which captures heat and moisture from the patient's exhaled air, keeping the humidity higher in the vicinity of the HME. When the HME is near the patient's face - like as part of a CPAP mask - the patient feels increased humidity levels. The first incorporation of HMEs into CPAP therapy was by Somnetics, makers of the Transcend II CPAP machine. Somnetics developed a proprietary HME system which required the use of a special mask to hold the HME in place. The Somnetics HME was a specially-treated sponge which was designed to fit into the Transcend H6B Waterless Humidification System. The only real drawback to this system is that it requires the use of a special mask. So, a CPAP user has to replace their existing mask with the Somnetics mask to utilize the HME humidity system. Since the mask is a significant added expense and requires the CPAP user to acclimate to a new mask design, it's not an ideal choice for replacing traditional water tank humidifiers. Near the end of 2013, a startup company called HDM (Human Design Medical) announced the availability of the world's smallest CPAP machine. 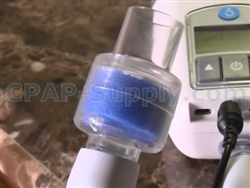 At just 10 ounces, the Z1 CPAP machine from HDM was so small and light the manufacturer didn't bother to make a traditional water tank humidifier, recognizing that a traditional humidifier design would defeat the purpose of a super-small, portable CPAP machine. As an alternative to the traditional water tank humidifier, Human Design Medical designed a universal HME module to be used with their Z1 CPAP. Two Z1 HMEs are included with the Z1 CPAP machine, and they're also available separately. The really great thing about the Z1 HME is that it can be used with absolutely any CPAP machine and mask. It's truly universal. You don't need to spend money on a new Z1 machine to use the Z1 HME when you travel with your existing CPAP machine. Using the Z1 HME couldn't be easier. One end attaches to the CPAP tubing, and the other end attaches to the CPAP mask. When you exhale, the HME sponge captures the heat and moisture from your exhaled air, maintaining a higher level of humidity in the mask. The HME doesn't interfere with CPAP pressure, and also doesn't interfere with proper venting of exhaled air. The HME is a couple of inches long, and is just slightly larger in diameter than a standard 22mm CPAP tube. Size and weight are insignificant, making the HME module a very good alternative to traditional humidification when traveling. You don't need distilled water (or any water at all), and you don't need to worry about emptying a water tank before packing up. You can't accidentally destroy your CPAP machine if you're using an HME for humidification! The manufacturer recommends replacing the HME after every week of use, but I view the HME as being similar to a toothbrush. I wouldn't think of replacing a toothbrush every week, and I'm sure you wouldn't either. If a CPAP user thoroughly rinses the HME after each night of use, I think an HME module can be used for several weeks before needing to be replaced. The main concern with the frequency of replacement is with regard to bacteria. Warmth and moisture contribute to bacteria growth, and if bacteria is present in the HME, then use of the HME could cause infection in the patient. Of course, if you've been sick with a virus or bacterial infection while using the HME, I'd recommend tossing it out after use, since the likelihood of contamination is significant. The bottom line here is I recommend using common sense with the HME. I certainly can't anticipate everyone's personal hygiene standards, so frequency of replacement is always going to be a personal decision for each patient. The HME module can also be used as an everyday humidification option, and that option might be cost-effective compared to buying a new humidifier unless you'll be replacing the HMEs frequently. The primary drawback to the HME humidification concept is that it's not adjustable like a traditional heated humidifier. The heat setting on a heated humidifier is the humidity setting - the higher the heat, the higher the humidity. So with a traditional humidifier you have control over how much moisture will be delivered into your mask. With the HME humidifier option, you have no control. If an HME sounds like a good option to you, give us a call and we can help you get one. After you use one for a while, we'd very much like to get feedback, so feel free to tell us what you think!